I really need to thank Dachshund Nola for being one of our biggest supporters over the year we've had the blog. Back in June, she gave us this Sunshine Award and we're finally getting around to thanking her personally for it. Our gratitude should not be measured by our lassitude. 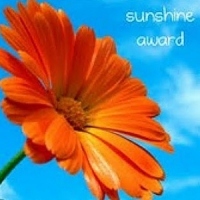 So you know the drill - there are some rules to accepting the Sunshine Award but they're pretty simple: Answer 7 questions and pass the award on to 10 people and let them know they've received it. Favorite non-acholalic beverage? Unsweetened iced-tea with lemon. Facebook or Twitter? Hmm, both? I find them to be very different - one connects me with friends and family, the other introduces me to new friends with whom I share similar interests. Favorite Flower? Hmm. So, I'm a gardener and there is no end to the flowers that have caught my fancy over the years. There is one, however, that endures in captivating me for its simplicity: the Shasta daisy. There is just something so pure and eternal in its grace. Roo's Doins - Roo is one of the coolest dogs in the 'ville and his mom is super crafty, great with Photoshop and apparently never sleeps. Whenever I want to check out a dog that just makes me smile, I go visiting. Seriously silly and all sweetness. Hey, It's Jet Here - Everybody knows Jet because it seems that Jet knows everybody. Jet and his mom manage to make it out to everybody's blog to say hi and keep in touch while also posting Every. Single. Day. Sometimes they're funny, sometimes informative, sometimes just supportive, encouraging or thankful. Always worth a visit. The (mis)Adventures of Sage - I have a confession to make: I have a crush on Sage. Don't tell Bella. Although Bella might actually like Sage. Sage is a crazy little mischief-maker who loves nothing more than she loves mud. Seriously. The blog 'chronicles' her adventures, has LOTS of pictures and stories and Sage. You really should follow the pretty dog. How Sam Sees It - I think everyone probably already knows Sam and Monty of "How Sam Sees It". The blog has been active since 2009! They are a recent discovery for me though and a lovely find at that. Sam and Monty are Golden Retrievers sharing their adventures with us. Another blog full of good stories, great pictures and pretty dogs. What's not to love? Dexter the Wonder Dog - Living in the shadow of "Mango, Relentlessly Huge", Dexter the Labradork may have not have been noticed for his very own large personality. But now, with his very own blog, it is on full display. This blog will make you laugh. And adore Dexter. Thank you very much, Dachshund Nola. As always, you honor us with your consideration. I had to laugh at your description of Sage. Yes, she can be a bit crazy and sure does love mud. Actually, it's the water that makes up the mud and she gets hot from running so much, but, needless to say, I've never had a dog like her. And that's why I love her so much. You never know what goofy thing she'll do next! Thank you for thinking of Sage! I'm glad I made you chuckle. :) I'm quite serious though, I do have a crush on her - she's so pretty, so silly and so sweet. She's quite the athlete as well which I do admire. Congratulations on your award! The cheerful flower is a lovely gift to receive this gloomy time of year. I've never thought about my favourite pattern before, what an interesting question! Congrats on your well-deserved award! I do like the idea of limiting the blogs you pass the awards on to. When I see a list of 13 blogs, I might skim through and pick only one or two new ones to check out, if the list is smaller....well you get the point. :-) Congrats again, I love reading about Bella and your devotion to her. Hi Bella!! I am your new follower!! Came over from Sage's blog. I love animals so very much and you look really good to me!! I am having eye trouble and don't really go to lots of blogs often!!! I wanted to meet you tho b/c I like your look!!! Thanks for dropping by and for saying hello. Sometimes the commenting system I use is a little funky. Sorry if you had problems with it.